President Donald Trump said he wants to issue an executive order ending birthright citizenship in the US. Also known as “jus soli”, it’s a policy whereby any child born within a country automatically becomes a citizen of that nation. 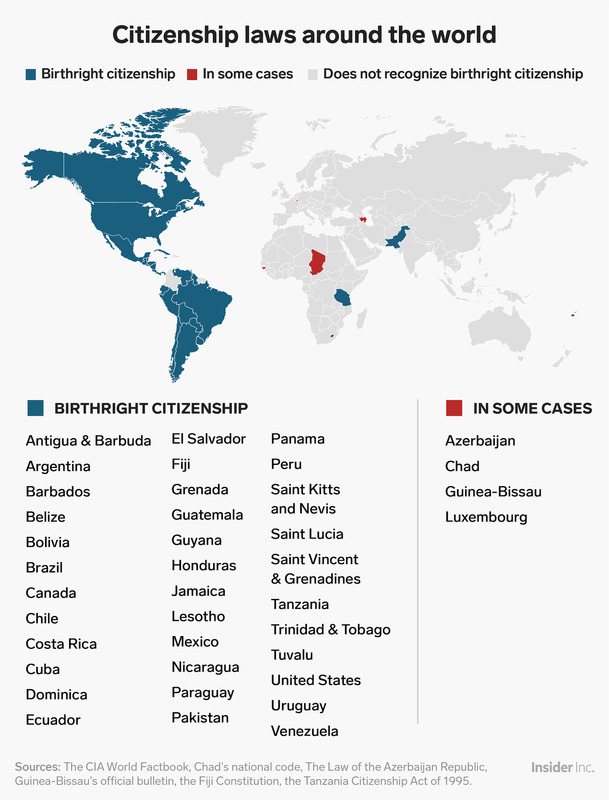 More than 30 other countries recognise birthright citizenship. A week before the midterm elections, news broke that President Donald Trump said he wanted to issue an executive order ending birthright citizenship in the US. Birthright citizenship is a policy whereby a child is granted citizenship by the country they are born in. The United States has recognised birthright citizenship, or “jus soli” as it’s known around the world, since the passing of the Fourteenth Amendment in 1868. That’s not true. While birthright citizenship is by far a rare policy throughout the world, more than 30 other countries recognise jus soli, and even more adhere to more restricted forms of birthright citizenship. But in the vast majority of countries, citizenship is determined by descent (also known as “jus sanguinis”). That can mean something different in each country, but for the most part it means having at least one parent who is a citizen of that country. Some countries, like Poland, require that both parents be citizens. Countries with patriarchal or matriarchal societies determine citizenship through the father’s or mother’s citizenship, respectively. For example, in Andorra, the mother needs to be a citizen for the child to become a citizen at birth. In several Muslim countries, such as Bahrain and Iran, the father needs to be a citizen for the citizenship to transfer, which creates complexities for children born out of wedlock. In recent years, several countries have transitioned from birthright citizenship to jus sanguinis. Those countries include India and Malta. *It should be noted that many countries that recognise birthright citizenship do not apply the rule to the children of foreign diplomats residing in the country for work.